Minor debts, derisive remarks, a fight over a parking space, butting in line—these are the little things that nevertheless account for much of the violence in human society. But why? Roger V. Gould considers this intriguing question in Collision of Wills. 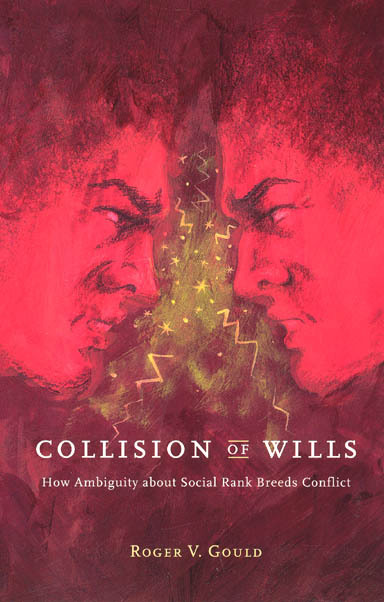 He argues that human conflict is more likely to occur in symmetrical relationships—among friends or social equals—than in hierarchical ones, wherein the difference of social rank between the two individuals is already established. This, he maintains, is because violence most often occurs when someone wants to achieve superiority or dominance over someone else, even if there is no substantive reason for doing so. In making the case for this original idea, Gould explores a diverse range of examples, including murders, blood feuds, vendettas, revolutions, and the everyday disagreements that compel people to act violently. The result is an intelligent and provocative work that restores the study of conflict to the center of social inquiry.